The smallcap & midcap stocks are one of the best investment bet for future. You must have noticed that in last three years midcap and smallcap index have grown by nearly 100% (2014-2017). It is but natural that midcap and smallcap companies have got very good scope when it comes to product portfolio and future expansion. These type of stocks are more likely to become multibagger stock in future. 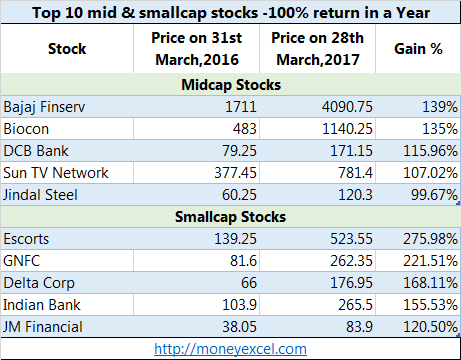 Let’s first take a look at 10 top mid & smallcap stocks that doubled investors’ wealth last year (2016-2017). So with the deep conviction that smallcap and midcap stocks will perform better in future here are 5 Best smallcap & midcap stocks for the investment. TCI – Transport Corporation of India is first midcap stock recommendation for Investment. TCI is leading logistic service provider of India. TCI has well integrated network of multiple logistic vehicles including trucks and ships. TCI will be one of the biggest beneficiaries of GST implementation. As it gives boost to logistics & supply change management business. You can invest in TCI with a target price of Rs.500 by 2018. HSIL – Hindustan Sanitary ware limited is a second stock recommendation for investment. HSIL is in the business of sanitary ware. HSIL will get benefited from upcoming infrastructure projects. GST will also give benefit to HSIL. HSIL is also one of the recommended stock by Porinju. You can invest in HSIL with a target price of Rs.450 by 2018. Gujarat Gas is next stock recommended for investment. Gujarat gas is expected to report healthy volume growth over the medium term supported by the steady private vehicle and tax conversion. The government emphasis on clean fuel will surely benefit this stock. You can invest in Gujarat Gas with a target price of Rs.1000. Alkem Laboratories is next midcap stock for investment. Alkem laboratories has shown strong growth in domestic business due to leadership in acute care segment. Alkem is expected to launch multiple products in the USA. The overall perspective of Alkem Laboratories is positive. Housing finance stock Dewan Housing Finance is next stock pick for investment. A growth in upcoming housing project will surely benefit this stock. The company has focused on low and medium consumer segment. This stock is recommended for investment with a target price of Rs.500.